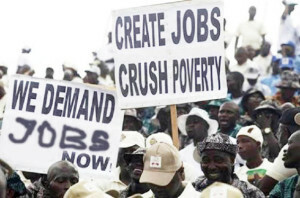 Nigeria’s employment crisis worsened in the first quarter of 2016, with unemployment rate rising to 12.1 per cent, the National Bureau of Statistics, NBS, said on Friday. The bureau said in its latest Unemployment Watch report that between December 2015 and March 2016, the population of unemployed Nigerians increased by 518,000 to over 1.45 million. Economically active or working age population, the NBS said, increased from 105.02 million in the fourth quarter of 2015 to 106 million by the end of March 2016. However, actual population of people willing, able and actively looking for work increased by 1.99 per cent, from 76.9 million in fourth quarter of 2015 to 78.4 million in the first quarter of 2016. The report said failure of government to meet its target of creating a minimum of 1.5 million jobs required for the period to keep the unemployment rate constant at 10.4 per cent before the end of December 2015 worsened the unemployment situation. The rate as at June end 2015 was 8.2 per cent and 9.9 per cent by September ending 2015. The NBS said its computations were based on the International Labour Organization, ILO definition, which described unemployment as the population of persons aged 15–64 who, during the reference period, were available for work, actively seeking for work, but were unable to find work. Consequently, the NBS said the unemployed Nigerian population were those who were actively looking for work, but could either not find work, absolutely nothing at all for at least 20 hours, or did something but not for up to 20 hours in a week during the reference period. Indications were that additional 1.53 million economically active persons joined the labour force between January 1 and March 31, 2016. Equally, the report said the number of Nigerians in the economically active population, who chose not to actively look for work, declined from 28.06 million in December 2015 to 27.5 million by end of March, 2016. Within the same period, the NBS said total number people in full time employment, or those who were doing any form of work for at least 40 hours, decreased by 528,148 persons or 0.97 per cent. On the other hand, the report said the number of underemployed, or those compelled by circumstances to do largely menial jobs not commensurate with their qualifications or not fully engaged for at least 20 hours during the period, increased by 607,613 persons. The report said underemployment rate increased by 18.7 per cent (14.41 million) in the last quarter of 2015 to 19.1 per cent in the first quarter of 2016 (15.02 million persons). The NBS said women population in the labour force continued to be affected more by the country’s unemployment and underemployment crisis when compared with their men counterparts. While 14 per cent of women in the labour force age bracket were unemployed in the first quarter of 2016, another 22.2 per cent were underemployed during the same period. Equally, the report said youth unemployment grew from 14.46 per cent in the last quarter of 2015 to 16.39 per cent in the first quarter of 2016.